We discovered, to some dismay, that pea-sized barnacles were starting to populate the bottom sides of Sequoia in increasing numbers. I popped some of them off with a stick, when we snorkeled at Las Islas Marietas a week and a half ago, but there was no way we were going to get all of them. Various sorts of vegetative growth were also starting to appear, so the bottom paint – chemically formulated to discourage such populations – was obviously giving up the ghost. We got on the phone, and on the internet, to find the place and the time where everything could come together for a successful haulout. The right paint, the right prop treatment, yard availability, decent price. We were hoping for La Paz, just before our passage to Hawaii, but that was not to be. In the end it was the paint and the prop treatment that won out. So here we are, on the hard at La Cruz de Huanacaxtle. Not the cheapest place to be, but they seem to do good work. Some of the things that came together here were due to our friendship with Walt and Patsy on Summer Rose. Their son is coming to visit, arriving tomorrow, and he’ll be bringing some specialized fasteners we were able have delivered to him in California. 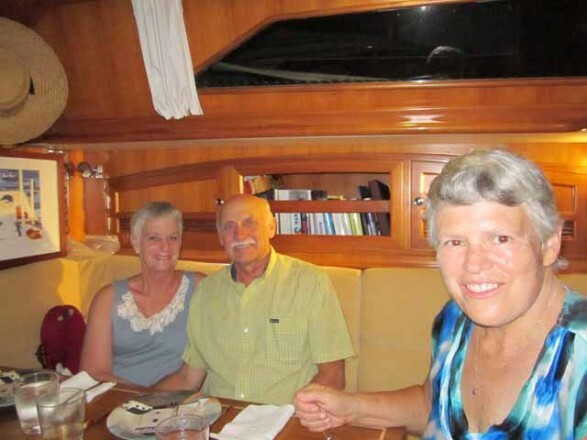 Walt and Patsy also knew another boat owner who was in Los Angeles, planning to drive here to La Cruz. We were able to contact him in time, and we had a couple of watermaker pumps delivered to him. You’d think we could get these things ordered and delivered directly to us in Mexico, but it doesn’t work. Four weeks minimum transit time, and no guarantees. Things get hung up in customs. Some manufacturers refuse to send items to Mexico at all. It was also Patsy who suggested the lovely La Cruz Inn, where we’re staying while the boat’s up on the hard. The La Cruz Inn is right on the plaza, next to the church. We’re in sight of the masts of the marina, and many sorts of Mexican life are on display, right outside our balcony. At dawn and dusk, the big iguanas can be seen up in the tops of the trees. During the day, trucks with mounted loudspeakers come by, repeating a message over and over, at top volume. Madame Housewife, we have watermelons, red and juicy. Zeta will refill your gas bottles. A reveille trumpet announces the arrival of the big 5 gallon jugs of purified water. In the evening, the women of La Cruz are practicing dances in the churchyard next door – a man accompanies them on a loud plastic bucket being used as a drum. They see us, and are all self-conscious, but finally relax. Each of the women carries a metal shaker, which creates a simple rhythm, repeated over and over. We have the hotel to ourselves. It only has five rooms, and at the moment we’re the only guests. There’s a lovely little swimming pool, three resident cats and a luxuriant tropical garden. Our unit has its own kitchenette, and we were able to salvage everything out of the boat’s freezer and refrigerator, and store it here. Across the courtyard is the “Arriba” Restaurant, reportedly with excellent food – Indian from India by way of Scotland – we’re planning to eat there tonight. One of the boats in the yard here is Luffin’ It, the boat that had a collision with a whale in Tenacatita Bay a few weeks ago. The yard doesn’t seem to be doing much with it – word is the insurance company may decide to total it out (paying the owners its insured value, and taking ownership of the boat). You can see the bent strut, the divots and cracks in the rudder, and deep scratches and fractures in the hull where the whale must have hit. It’s a sobering sight. We continue to plan and prepare for our passage to Hawaii, set for mid April. A few nights ago we had a happy hour/roundtable with three other boats that are also headed to Hawaii. We have crew lined up, provisioning is mostly done (except for the fresh fruits and vegetables to be bought the day before we leave), and we’re working out the insurance kinks. We’re hoping we’ve left ourselves enough time to have a couple of weeks in the Sea of Cortez, where the water is reportedly crystal clear, and the sea life fascinating. We’ll keep you posted!